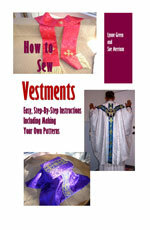 I am looking for magenta buttons to replace those on Monsignor's cassock. One is lost so I need to replace them all. What is a good source for the ornate buttons I am looking for? The one time I made a Bishop's cassock, I bought fabric-covered buttons and covered them with fabric that matched the cassock trim. Considering that you will need 33 buttons for the cassock (one button for every year that Christ walked on earth), fabric buttons are the simplest and most economical option. The cost - assuming that you replace all the buttons (finding an exact match will likely be extremely difficult) - will probably about $10 for all the buttons. Your best place to find these is at a fabric store. However, if you want antique buttons, you will have to do a little more digging, both into your wallet as well as on the web. But it can likely be done. Look for online sites that sell buttons. Many of them sell antique buttons.